Following a memorable, belated birthday concert in Pasadena, LA on February 23, Thea Musgrave was presented with a Lifetime Achievement Award for Music Composition from the American Composers Forum LA (ACF-LA). Held in Pasadena’s Boston Court, The Eclipse String Quartet, Mark Robson, Nicholas Daniel and a host of friends gathered to perform tribute to the Scottish-American composer in the closing months of her 90th year. Featured on the programme were Niobe, Threnody, Pierrot, Cantilena alongside many other chamber duos. Fellow composer and long-time friend Jack Van Zandt held a pre-concert interview with the composer for the audience. Thank you dear friends and colleagues ; and thank you Jack for putting this all together, for bringing together the incredible performers for this concert – what would we do without the performers?! So thank you, thank you – what can I say? I’m speechless! Thea and I were absolutely thrilled with each and every performance last night. I think it was the most incredible concert and honour for Thea EVER – the warm feeling in the room, the expertise and dedication of every one of you. Musgrave, Scottish born and raised, first became acquainted with the music scene on the west coast of the US in 1970 when she took up a post as Guest Professor of Composition at the University of Santa Barbara, California. She and Peter moved to the US in 1972. Since retiring from her post as Distinguished Professor at Queens College, City University of New York in 2002, she and Peter have spent their time between New York and Playa del Rey, CA, Musgrave continuing to compose on both sides of the US. Of the post-Britten generation, Thea Musgrave has one of the more impressive opera CVs with ten currently to her name. Ninety this year and still going strong, 1977’s Mary, Queen of Scots falls neatly in the middle of her output. Given that Musgrave is a) a woman and b) was born in Scotland, her take on the frequently over-romanticised monarch is notable for a (mostly) factual account of her troubled time on the throne – Musgrave herself wrote the libretto – and a tonal, if frequently spiky and harmonically pungent musical language. Musgrave presents a self-aware pragmatist determined to secure her reign, albeit through a series of politically disastrous liaisons with a half-brother and two fatally-flawed husbands. Eschewing sentimentalism, the score’s fierce energy crackles with conflict, while offering moments of musical titillation by the deployment of well-integrated Scottish consort and dance music. Lyrita’s release restores the live American premiere to the catalogue, with Ashley Putnam a thrilling and sympathetic Mary and fine performances by the men in her life: Jake Gardner as bullying brother James, Earl of Moray, John Garrison as her unstable peacock-of-a-first-consort Lord Darnley and Barry Busse as the egotistical Earl of Bothwell. Peter Mark (Mr. Musgrave) drives the drama for all it’s worth while the occasionally cough-riddled sound is acceptable. An important reissue. From November 22-25 the Stockholm International Composer Festival, which in previous years has honoured such renowned composers as Alfred Schnittke, Michael Tippett and Henri Dutilleux, welcomesThea Musgrave. Now in its twenty-seventh year, the Festival is one of the classical music world’s most high-profile opportunities to discover the full breadth of a singular composer’s music and largest focus on Musgrave's music to have ever been held. Four orchestral and chamber concerts, hosted at the Swedish capital’s premier concert hall, will be given by the Royal Stockholm Philharmonic Orchestra (RSPO), the Norrköping Symphony Orchestra, Karen Kamensek and Finnish-Ukrainian conductor, Dalia Stasevska. As well as providing a comprehensive overview of Musgrave’s long career, the RSPO will join with Nicholas Daniel to give the world premiere ofNight Windows for oboe and strings. The work takes its title from Edward Hopper’s striking painting of the same name, exploring the emotional themes that permeate his work more generally over five movements. It will feature alongside Turbulent Landscapes, The Seasons and Loch Ness in a programme of Musgrave's orchestral works which are inspired by art. This November, Lyrita Recorded Edition release their second CD of year celebrating the music of Thea Musgrave in her ninetieth year, Phoenix Rising [SRCD.372]. Recorded in January, William Boughton leads the BBC National Orchestra of Wales in a portrait disc containing three premiere commercial recordings. Tuber player, Daniel Trodden takes on the role of the mysterious Loch Ness Monster in the light-hearted 2012 work Loch Ness. Subtitled ‘a postcard from Scotland’ the pictorial orchestral opener was originally commissioned by the BBC Scottish Symphony Orchestra and premiered by Donald Runnicles. This will be the first time to hear the work in the UK since then. The disc’s titular work, which received a special performance at this year’s BBC Proms almost twenty years after the premiere, is an orchestral tone poem progressing from darkness (low and fast music) to light (high, slow and peaceful). The opening stormy violence, filled with lyrical and dramatic string writing leads to a terrain of emptiness and despair. The second half of the work in contrast builds to a romantic climax and a coda of serenity of peace as the phoenix rises; two harps set either side of the orchestra downstage gentle evoke the billowing wings as the Phoenix disappears into the distance. Also joining these two late orchestral works by Musgrave is her Poets in Love for tenor, baritone and piano four hands. Seventeen poems spanning many centuries and languages give very varied views on the subject of love. Totaling around thirty minutes, each song – some solos, some duets – are sung without break. A rarely heard work due to its complexity, this CD offers a wonderful opportunity to hear it time and time again thanks to Nathan Vale (tenor), Simon Wallfisch (baritone) Simon Callaghan (piano, primo) and Hiroaki Takenouchi (piano, secondo). Phoenix Rising [SRCD.372] will be available to purchase and steam on Spotify from November 1, 2018. On July 6, forty years after the premiere recording of Musgrave’s seminal opera Mary, Queen of Scots, Lyrita released a restored version. It was released on CD in 2002 on Novello Records but has been unavailable for years following its initial print run. Recorded in one take from a live performance at the Virginia Opera House in 1978, this cleaned-up version taken from the original master LP features stella performances from leads, Jake Gardener and Ashley Putnam. Available to purchase here and to stream online via Spotify. The new season has begun and the nights are drawing in; but, while there is still lots more Musgrave to look forward to this Autumn, let us recap on what has been a spectacular summer. Gathering just off Times Square in the atmospheric Church of St. Mary the Virgin, Harold Rosenbaum, the New York Virtuoso Singers, the American Brass Quintet and host of special guests joined on May 27 to celebrate the birthday itself, wth Thea in attendance. Wonderful tributes from collaborators past and present, Nicholas Daniel and Ashley Putnam, were interspersed among performances of Thea’s choral, chamber and rare outings of her operatic music, plus world premiere performances of Whirlwind for solo oboe and La Vida es Sueño, performed by the Mexican baritone José Adán Pérez and pianist Michael Fennelly. Full concert details here. Straight after the concert Thea and Peter dashed across the atlantic to attend the 63rd Ivor Novello Awards on May 31 at Grosvenor House, Park Lane, London. The Scottish-American composer Thea Musgrave was presented with The Ivors Classical Music Award, in recognition of her outstanding body of work in the classical genre. The Ivor Novello Awards are the UK’s pinnacle recognition of song writing achievement, celebrating composers of all genres of music. Previous recipients of the Classical Music Award include Richard Rodney Bennett (2004), John Tavener (2005), Harrison Birtwistle (2006) and Peter Maxwell Davies (2010). The award was presented by longtime friend, Nicholas Daniel. To an audience of the industry’s most notable names, including fellow award-winners, Billy Ocean, Billy Bragg, Stormy and Ed Sheeran, Thea gave a speech about the power and universality of music and the absolute importance for all children, no matter their background, to have access to learning an instrument. It would be impossible to mention all of the performances of Thea’s work but in early June a flurry of concerts in the UK and US added to the momentum of the birthday week. On June 2, whilst the New York Virtuoso Singers performed highlights from the birthday concert (Rorate Coeli, Voices of Our Ancestors) at New York’s Symphony Space, the York Late Music Ensemble in the UK hosted a portrait concert, the final part in their season-long focus on Musgrave’s music. Jennifer Cohen (flute), Alice Masterson (piano), William Descrettes, (cello), Lynette Quek (electronics) performed Narcissus, Snapshots, and the UK premiere of D.E.S. — In Celebration for solo cello. The Marsyas Trio contacted Thea earlier this year to seek permission to create a clarinet version of her popular Canta Canta and on June 8 it received its world premiere at London’s Spitalfields Festival. Now recorded, the recording will be available on NMC Recordings from October — pre order here. 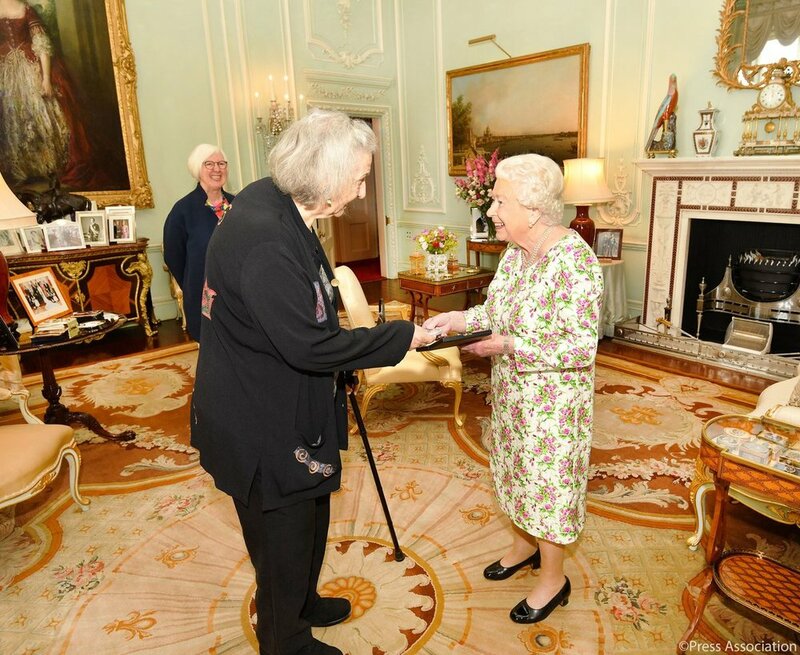 On June 7, Thea was awarded the The Queen’s Medal for Music in an audience with Her Majesty The Queen at Buckingham Palace. Musgrave was welcomed by the Queen’s Master of Music, Judith Weir and conversed with The Queen for half an hour — the details of the exchange, of course, remain secret! ‘Scottish-born composer Thea Musgrave has been a musical pioneer for many decades. With innovative use of space, sound and colour, her work has made rich contributions to numerous genres, including opera and orchestral music. Now aged 90 and resident in New York, she is still energetically at work, a warm-spirited, optimistic inspiration to her many listeners, performers and colleagues around the world.’ — Judith Weir. On June 15, the Dutch conductor Jac van Steen conducted the orchestra in their performance of Musgrave’s Song of the Enchanter, Memento Vitae and Two’s Company with Nicholas Daniel and Evelyn Glennie, who reunited for the first time on the concert stage to perform the work for first time since its premiere in 2005. At the beginning of the second half of the concert, Thea was conferred with an Honorary Doctorate in Music from the Royal Conservatoire of Scotland and gave a brief speech thanking the conservatoire and reiterating the her gratitude to the BBC SSO. The concert was broadcast on BBC Radio 3 on June 29. Two new choral works were given life this June as the Wells Cathedral Choir and director Matthew Owens premiered a new Missa Brevis and Collect for the Birth of John the Baptist. Both highly singable, functional cathedral works these new additions to the repertoire, are part of an ongoing project at the Cathedral to create living Cathedral through contemporary music. Thea met the host of commissioners and the young choristers themselves, many of the young singers visibly thrilled to have someone with such experience there. Wells Cathedral also invited Thea to attend a lunchtime concert of her works performed by the students, after which she gave a lecture to the composition students. Forty years after the premiere recording of Musgrave’s seminal opera Mary, Queen of Scots, Lyrita released a restored version on July 6. It was released on CD in 2002 on Novello Records but has been unavailable for quite some time following its initial print run. Recorded in one take from a live performance at the Virginia Opera House, this cleaned-up version taken from the original master LP features stella performances from leads, Jake Gardener and Ashley Putnam. Available to purchase here and to stream online via Spotify. There is no bigger classical music festival than the BBC Proms. But it is not only its size that makes the two-month series special, it is diversity of the audience that it welcomes. Audience members of all levels of exposure to classical music, from countries all over the world, attend the seventy-odd concerts each year. It offers no greater platform for contemporary classical music to reach the widest audience, and this year, on August 7, it was no different. Richard Farnes, former Musical Director of Opera North, conducted Phoenix Rising in his Proms debut with the BBC Symphony Orchestra. The work is both dramatic and serene with a touch of humour in the middle section, where the horn player (representing the forces of light), banishes the timpanist (the leader in the forces of darkness) from the stage. A near-capacity audience (over 5000 seats total) chuckled accordingly and warmly received the work’s orchestral invention an lyricism. The concert was broadcast on radio live and on national television on August 10. ‘I remember the very first Edinburgh Festival’ Musgrave recounted in her pre concert talk to festival patrons ahead of the performance of her Turbulent Landscapes at Edinburgh’s Usher Hall, ‘they lined the streets with baskets of flowers of all colours —in postwar Scotland, that was quite something!’ Indeed, Musgrave would go on to conduct her own Mary, Queen of Scots at the Festival in 1977. Two concerts contained her music: the first being the August 5 concert by the National Youth Choir of Scotland, masterfully directed through her On the Underground Set 2: The Strange and the Exotic by conductor Christopher Bell. On August 9, now with Thea in attendance, having flown up from London the morning after her Prom, she received the Royal Society of Edinburgh’s Royal Medal from HRH Prince Edward, the Earl of Wessex. That evening, Martyn Brabbins lead the BBC SSO in and sea-theme programme contain Vaughan Williams’ Sea Symphony and Thea’s Turbulent Landscapes. Outside of the concert hall, Thea participated in a seminar about gender equality in the arts, led by actor and Equity president Maureen Beattie, Artistic Director of the National Theatre of Scotland Jackie Wylie, film producer Alison Owen, and veteran Scottish Arts Critic Ruth Wishart. There is still plenty more to come! The latest performance of Thea Musgrave's Phoenix Rising is available to watch on the BBC iPlayer until September 10. Former Opera North Principal Conductor Richard Farnes and the BBC Symphony Orchestra staged the tone poem in celebration of the composer's ninetieth birthday on August 7. The Medals were instituted by Her Majesty The Queen in the year 2000. They are awarded annually, to individuals who have achieved distinction and are of international repute in any of the following categories: Life Sciences; Physical, Engineering and Informatic Sciences; Arts, Humanities and Social Sciences; Business, Public Service and Public Engagement. Candidates for the Royal Medals need not be RSE Fellows and should, preferably, have a Scottish connection, irrespective of place of domicile. Previous recipients include Dr Donald Runnicles OBE and Baroness Helena Kennedy of the Shaws QC. Established in 1783 the RSE is an educational charity, registered in Scotland, operating on an independent and non-party-political basis, providing public benefit throughout the country in a range of disciplines. The BBC Scottish Symphony Orchestra's celebration of Thea Musgrave's 90th-birthday year is now available to listen to on the BBC Radio iPlayer. The concert was recorded at the Glasgow City Halls on June 15 and was broadcast on June 29. Two's Company, Phoenix Rising, and several other works were conducted by Jac van Steen. The program features an interview between Thea and Jamie McDougall, further selections of the composer's music, plus the presentation of an honorary Doctorate given to Musgrave by the Royal Conservatoire of Scotland. Duration: 2 hrs approx. * CD broadcasts. The composer Thea Musgrave CBE has been awarded The Queen's Medal for Music 2017. The award was presented to Ms Musgrave by The Queen in an audience at Buckingham Palace on Thursday, 7 June 2018. She becomes the thirteenth recipient of the award, following Nicola Benedetti, who received the medal last year. Established in 2005 by Sir Peter Maxwell Davies, the award is presented annually to an outstanding individual or group of musicians who have had a major influence on the musical life of the nation. The nominating process for the award is overseen by a committee under the chairmanship of the Master of The Queen's Music, Judith Weir. The committee's recommendation is then submitted to The Queen for approval. Scottish-born composer Thea Musgrave has been a musical pioneer for many decades. With innovative use of space, sound and colour, her work has made rich contributions to numerous genres, including opera and orchestral music. Now aged 90 and resident in New York, she is still energetically at work, a warm-spirited, optimistic inspiration to her many listeners, performers and colleagues around the world. Although much of my career has been on an international stage, this medal represents my British heritage. It also recognises the impact my Scottish roots have had on my music - which continue to inform and nourish my work and anchor my role in the world. It is a delight and a joy to see Thea Musgrave receiving accolades at the highest level so long deserved. Thea remains trenchant in her passion, enthusiasm and appetite not only for continuing her own unique work as a composer, but also for the importance of access for all to the work of others in the great tradition of classical music, both past and present. A lesson for us all. On May 31 at the 63rd Ivor Novello Awards held at Grosvenor House, London, the Scottish-American composer Thea Musgrave was presented with The Ivors Classical Music Award, in recognition of her outstanding body of work in the classical genre. The award coincides with Musgrave’s ninetieth birthday (May 27), which is being celebrated throughout 2018 at a host of events. Music! Whether one dances for joy or laments for loss, we are able to communicate our truest human nature to others through music even as we experience it to the fullest for ourselves. Music is basic to the human spirit. Those of us who work in the arts have the sacred mission to sustain a legacy which confirms the common bond of all human life even as we do it through our own unique cultural, temporal, ethnic, and individual voices. The fact that those voices — of the Ancient Greeks, Persians, Egyptians, Chinese, Africans — are still heard today attests to both the importance and tenacity of artistic communication. Closer to our own time, the fact that Monteverdi, Bach, Mozart, Wagner, Stravinsky and Britten are still top of the charts even after all of these years, confirms the power of classical music. That is the mission I am proud to be part of. And I believe that is the true meaning of the life and legacy of Ivor Novello. I am enormously proud to now be part of that legacy. Now I would like to thank some people. There are just too many to be able to mention them all... but I want to mention a few. Composers cannot exist on their own, because obviously above all we need performers. So, as a representative of all those fabulous performers, a big thank you to Nicholas Daniel. Apart from his quite extraordinary gift as a performer he has just begun something which I think is incredibly important: he has called it ‘Every Child a Musician’. He wants to bring musical instruments into schools so indeed every child would have the opportunity to make music a meaningful part of their lives. So, thank you performers. And that includes conductors, as well as stage directors, set designers and so on. I must also thank my publishers. They have to put up with me being very old fashioned....you see, I decided in the 90s that I was just too old to learn about Sibelius. By Sibelius I mean the way that music can be inputted into a computer rather than the old fashioned engraved. So publishers, thank you for your patience. Finally one other thing: it is very difficult for a young composer to get good practical experience of writing for an orchestra. So I want to thank the BBC Scottish Symphony Orchestra. When I was just starting out they performed several of my very early orchestral works, some under the baton of Colin Davis who was the assistant conductor at that time… he was just starting out on his great career. So again, thank you for this award. It is indeed a great honour. The Ivor Novello Awards are the UK’s pinnacle recognition of song writing achievement, celebrating composers of all genres of music. Created by BASCA in 1956, The Ivors have been sponsored by PRS for Music since 1974. Previous recipients of The Ivors Classical Music Award include: Richard Rodney Bennett (2004), John Tavener (2005), Harrison Birtwistle (2006), Jonathan Dove (2008), James MacMillan (2009), Peter Maxwell Davies (2010), Michael Nyman (2011), Errollyn Wallen (2013), John McCabe (2014) and Judith Weir (2015). The Leicester International Music Festival has announced Thea Musgrave as its featured composer, honouring the composer’s ninetieth birthday. The festival, which runs from September 20-22, will feature selections of Musgrave’s chamber music in five concerts. The inclusion of Musgrave’s music fits into the weekend’s larger focus on music by composers who moved to the United Sates during their careers, composers including Dvořák, Martinu, Rachmaninov and Bartok. Click here to view the full concert listing and purchase tickets. The BBC Symphony Orchestra will mark Thea Musgrave’s ninetieth birthday year with a performance of her orchestral work Phoenix Rising on August 7 in Prom 33 of the festival. Conducted by 2017 Royal Philharmonic Society award-winning conductor and former Music Director of Opera North, Richard Farnes, the orchestra will also perform Brahms’s A German Requiem. This performance will be just the latest in a long line of works featured at the Proms over her career: Concerto for Orchestra (1968), Horn Concerto (1971, 1978, 1988), Memento Vitae (1980), Clarinet Concerto (1984), Helios (2003), Ithaca (2010), Loch Ness (2012) to name just a few. Indeed, below is a picture from 1973 when Musgrave returned to the UK from her new home in Virginia, USA to conduct her husband Peter Mark in a Proms performance of her Viola Concerto. General booking for the 2018 BBC Proms in London opens on May 12 and can be reserved by logging on to the Royal Albert Hall website here. The Stockholm International Composer Festival is one of the classical world’s most high-profile opportunities to discover the full breadth of a composer’s music. This November in the Swedish capital’s premier concert hall, the Royal Stockholm Philharmonic Orchestra (RSPO) and Norrköping Symphony Orchestra will celebrate the work of Thea Musgrave. The festival, which has honoured classical music’s most important composers over its twenty-two-year history, runs from November 22-25 and will provide a comprehensive overview of Musgrave’s long career, in four orchestral and chamber concerts. It joins a long list of important celebrations marking the British-American composer's ninetieth birthday. In the opening concert, on November 22, Nicholas Daniel joins the Royal Stockholm Philharmonic Orchestra give the world premiere performance of Musgrave’s Night Windows for Oboe and 15 Strings. Night Windows is inspired by Edward Hopper’s striking painting of the same name. The five scenes in Musgrave’s work, however, are all imaginary, highly charged emotional moments derived from Hopper’s work more broadly, subtitled ‘Loneliness’, ‘Anger’, ‘Nostalgia’, ‘Despair’ and ‘Frenzy’. The American conductor Karen Kamensek will conduct the premiere in a programme of Musgrave’s most powerful orchestral works inspired by art: Turbulent Landscapes, The Seasonsand Loch Ness. The RSPO will repeat this concert two days later, with one programming change: Daniel performs Musgrave’s oboe concerto, Helios, in place of Night Windows. The Finnish-Ukrainian conductor Dalia Stasevska takes up the baton on the second evening of the festival (November 23) with a programme exhibiting the full range of Musgrave’s music, performed by the Norrköping Symphony Orchestra. Beginning with the Concerto for Orchestra (1967), the second half of the concert then opens with her epic orchestral song cycle Songs for a Winter’s Evening (1995), and concludes with one of Musgrave’s earliest mature works, Scottish Dance Suite (1959). Violist Ellen Nisbeth will join the orchestra to perform Lady Caroline Lamb, Elegy for Viola and Orchestra, an iconic piece for the instrument by Musgrave’s close friend and artistic confidant Richard Rodney Bennett. Soloists from the RSPO and Nicholas Daniel close the festival on November 25 with a concert of Musgrave’s chamber works, many exhibiting her period of experimentation with electronics in the 70s and 80s. The programme will include: A Song for Christmas, Music for Horn and Piano, From One to Another, Niobe, From Spring to Spring, Threnody, Snow and Dawn. Konserthuset’s huge annual Composer Festival was founded in 1986 and quickly became an essential element of both Swedish and international music scenes. The fundamental idea – to spend an intensive period featuring modern, established composers – has proven to be successful both artistically and among audiences. Since its establishment is has hosted some of the most important composers from around the world including: Witold Lutoslawski (1987), Alfred Schnittke (1989), Sir Michael Tippett (1997), Sofia Gubajdulina (2000), Lars Ekström/Bent Sørensen/Rolf Wallin (2001), Kaija Saariaho and Magnus Lindberg (2002), Henri Dutilleux (2003), Esa-Pekka Salonen (2004), Hans Werner Henze (2006), Thomas Adès (2009), Steve Reich (2010/11), and Per Nørgård (2012). Scotland’s capital city will once again become a three-week celebration of the performing arts, featuring the finest performers and ensembles of dance, opera, music and theatre. This week, Edinburgh International Festival (EIF) unveiled its 2018 programme, which runs from Friday, August 3 to Monday, August 27, and we are delighted to say that they will celebrate Thea Musgrave's ninetieth year with two performances of her works. On August 5, the National Youth Choir of Scotland under the conductor Christopher Bell perform Musgrave’s settings of strange and exotic poems from the London Underground, On the Underground Set No 2. A Scottish Premiere of Musgrave’s Turbulent Landscapes – a sequence of six independent movements through the land and seascape paintings of J.M.W.Turner – will be performed by BBC Scottish Symphony Orchestra and conducted by Martyn Brabbins on August 9. It will open to Vaughan Willliam's epic Seas Symphony. This International Women’s Day, Trinity Laban Conservatoire of Music and Dance announced that they will be staging a new production of Thea Musgrave’s 1979 opera A Christmas Carol as part of their new season focus Venus Blazing. Venus Blazing is an unprecedented commitment by the conservatoire to the music of women composers throughout the next academic year, ensuring that at least half of the music it chooses for its public performances will be by women composers. This year they have chosen to highlight the work of Thea Musgrave, one of the most prolific women composers of opera – with eleven titles to her name. A Christmas Carol closely follows Charles Dickens’ beloved novel and will be given its second ever UK performance by the opera and vocal students of the conservatoire. It will take place in early December; more details will be announced later in the year. This announcement follows the performance of two concerts earlier this month by the Trinity Laban Chamber Choir, dedicated to the composer’s choral music in celebration of her ninetieth birthday. 'Trinity Laban Conservatoire of Music & Dance is strongly committed to diversity in all elements and it has a mission to constantly challenge the status quo. Venus Blazing is a great example of just how it can do this. This celebration will encourage and inspire its students – many of whom will go on to shape the future of the performing arts - to engage with the historic issue of gender imbalance in music by women, and ensure that it does not continue into the next generation. More information on Venus Blazing can be found here. Follow all the events marking #Musgrave90 by visiting theamusgrave.com and follow @MSClassical/musicsalesclassical on Twitter and Instagram. From February 1-2, the Royal Northern College of Music and the BBC Philharmonic Orchestra will celebrate the music of Thea Musgrave to mark her ninetieth birthday. The two-day festival ‘In Focus: Thea Musgrave’, led and curated by Clark Rundell, will feature concerts from the students, masterclasses and Q&As, and the performance of a world premiere. Beginning at 7:30 Thursday evening, the RNCM New Ensemble and RNCM Wind Orchestra will perform Musgrave’s Lamenting with Ariadne,Power Play and Journey Through a Japanese Landscape under three conductors: Mark Heron, Melvin Tay and Alexander Webb. The New Ensemble will also perform her 1974 Koussevitzky Award commission, Space Play, a concerto for nine instruments (originally written for the London Sinfonietta) in which each player takes turns leading the group sans conductor. A new work by RNCM student Edgar Divver will also feature in the programme. The concert, which will take place at the RNCM Concert Hall, will be introduced with a pre-talk in the Carole Nash Recital Room between Musgrave and Clark Rundell. On Friday, February 2, students will perform Musgrave’s small chamber works and a new work by student Robin Wallington in the Carole Nash Recital Room. The programme includes Voices from the Ancient World, Take Two Bassoons and Wind Quintet. The festival concludes that evening at the MediaCity Studio. Clark Rundell leads the BBC Philharmonic in a first half of orchestral song (Song of the Enchanter, Songs for a Winter's Evening, Five Songs for Spring); followed by the world premiere of a new cello concerto for British cellist Josephine Knight, From Darkness into the Light. Closely based on her 2005 work Journey into Light for voice and chamber orchestra, this re-imagining (which now adds percussion and clarinet to the orchestral line-up) draws from one anonymous 15th-century poem and two others by the Scottish poet William Dunbar (1460?-1513?). In his poems Dunbar describes the promise of salvation after life’s dark passage and each of the three poems echo the thought that the poet can overcome the fear of his inevitable death with the certainty of salvation. Three new cello cadenzas employ elements of Musgrave’s self-defined ‘dramatic-abstract’ and perform thematic responses to Dunbar’s text. The BBC Philharmonic conclude the concert with Musgrave’s ever-popular The Seasons. The performance will be recorded for future broadcast on BBC Radio 3. Admission to all events is free. For more information about the festival click here. Applications for tickets to the BBC Philharmonic Studio performance can be found here. On 27 May 2018, one of Britain’s most distinguished composers, Thea Musgrave, turns ninety and will have clocked up almost seventy years in her profession. An impressive feat, she still maintains an active writing schedule, composing with amazing energy and passion. Several performances and premiere recordings marking the occasion are already scheduled to take place in Europe and America in 2018. Having just completed a chamber reduction of her seminal opera Mary, Queen of Scots, she is now working on a new ten-minute work for piano and baritone which takes its text from Calderón’s La Vida Es Sueño, a Missa Brevis, and an organ piece based on J.S. Bach’s Orgelbüchlein. If you would like to find out more about Thea’s music, the plans already in place for the 2017/18 season, or have your performances lined up, then please do not hesitate to contact promotion@musicsales.co.uk. Find us on Facebook and Twitter using the official hashtag #Musgrave90.